Mainstreet Cleveland's Classic Christmas weekend launched the Christmas holidays Friday night with the community tree lighting. Once the tree was lighted, the crowd took part in reverse caroling by walking from location to another to hear choirs sing. Children talked with Mr. and Mrs. Santa Claus. There were carriage rides around the courthouse too. The festivities continued with a Christmas parade on Saturday and a Class Christmas concert at Lee University Sunday afternoon. 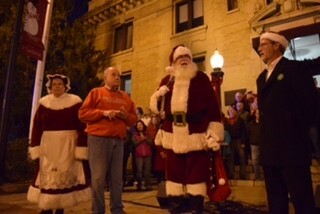 Mrs. Claus, Mayor Tom Rowland, Santa Claus and Bradley County Mayor D. Gary Davis helping light the Christmas tree. 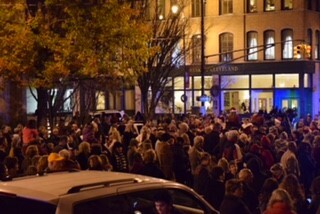 Residents gathered in downtown Cleveland to watch the tree lighting. 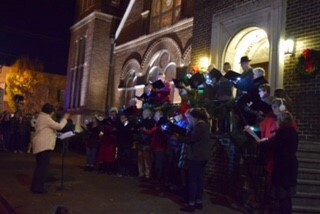 Broad Street United Methodist Church was one of the stops for the reverse caroling.